Free Shipping Included! Christmas Light Projector, Rotating Sparkling Landscape Lamp with Wireless Remote Controller, 16.4ft Power Cable and RGB 7 Patterns for Xmas Halloween Party Disco Wedding Garden Birthday Decorations by Hapico at Defy Now. Hurry! Limited time offer. Offer valid only while supplies last. Function keys for Christmas Light Projector On/Off:Light On/Off Press on/off while unit is plugged on and remote will connect unit in 5seconds. Press on/off while unit is plugged on and remote will connect unit in 5seconds. 2.Adjust the angle of the LED projector light by loosening and then tightening the angle adjustment knob. 3.Insert the adjusted projector light to the stake. 4.Connect the 2-pin plug of the power cord to the projector power inlet insuring proper polarity. To avoid water getting in, make sure to turn the plug cap clockwise until secure. 5.Connect the adapter to a UL listed extension cord or to a UL approved electrical outlet. 1.BEST PROJECTION EFFECT: The longer the distance from the projection plane, the larger the projected area of the lamp. If the projection space is darker, the better the projection effect. 2.AUTOMATIC TIMER: Hapico light projector, you can set a timing mode using the remote control and the light will turn on the same time every day or night and turn off again either 2, 4 or 8 hours later, energy conservation. 3.EASY INSTALLATION& REMOTE CONTROL: The lamp comes with a base and a long spike,The projection light can be skated into the ground.With the stake removed,it can also be mounted to a structure using a sturdy hanging clamp and safety cable. 4.WATERPROOF FOR OUTDOOR: Place it outdoor without worrying about rainy or wet weather, but please DO NOT put the light underwater or soak the light in heavy rain. 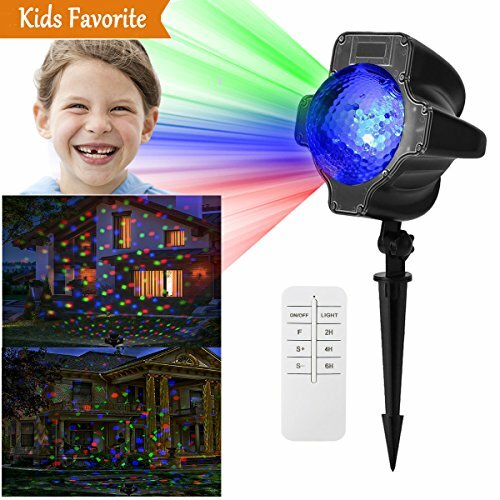 It's great for decorating your garden, house, fence, bush, tree, wedding, church, school Christmas, etc, making an outstanding light show among your neighborhoods. 5. UL-Approved High Quality & Warranty-Guaranteed: This projector light is made of good quality plastic material. Cool lighting is energy-efficient in power consumption, reliable and hazard-free in performance. If you have any problem concerning our light, please contact us and we will try our best to help you. If you have any questions about this product by Hapico, contact us by completing and submitting the form below. If you are looking for a specif part number, please include it with your message.